NEW ORLEANS – They are not American men, though some of them have American homes and the most prominent among them has shouted: "I am an American!" on national television. They were not raised in American culture, yet they have become such a part of it that many forget they were never American to begin with. Then maybe it isn't odd that the group of Irishmen who make up the band U2 have played two of the most cherished of American events following the most awful recent American disasters. Nor is it strange that they did it in the same building that sits in one of American's most musical cities. Because in the end, this isn't about being American or not being American but about understanding the agony and the healing that follow catastrophe. So it is fitting that of all the NFL's pregame and halftime shows, the two most poignant were performed in the Superdome by U2. Because who, really, was a better choice to play at halftime of Super Bowl XXXVI and scroll the names of the Sept. 11 casualties across the dome's ceiling? And then 13 months after a hurricane ripped apart that very roof on which the names rolled, was there anyone better to stand beside an American band, Green Day, and together play a song symbolizing a city's rebirth? And what could be better in the home of the New Orleans Saints than for the song to be, "The Saints Are Coming?" "You know I think that 2002 show could have been in any city in the world, " says Charles Coplin, who as the NFL's executive vice president for programming attended the 2002 show and produced the 2006 reopening. "But I definitely think that in 2006 it was because it was in New Orleans. I think it was in part because of the experience they had in 2002, but I think U2 also has great respect for American music. "What was great about that second show is that it was a great musical tribute to New Orleans." Or in the words of Quint Davis, the New Orleans native who runs the city's famed Jazz Fest and helped put together the 2006 reopening show: "U2 is kind of cool." They will not be playing Super Bowl XLVII between the San Francisco 49ers and Baltimore Ravens in New Orleans on Sunday, of course. That will be Beyoncé. While the memory of those two shows – perhaps the greatest the NFL has ever produced – remains fresh for many, more amazing is how close neither came to happening. It was Oct. 25, 2001 and the NFL had a problem. Only weeks before, the planes had smashed into the buildings and the country was still in a deep mourning. Now the league had to plan a Super Bowl halftime show but nobody was available. Jim Steeg, the league official who ran the Super Bowl, had booked Janet Jackson. Yet like most artists, she had canceled her tour. She was not traveling. Almost no one was. The task of finding a replacement fell to John Collins, who was the executive in charge of the halftime show. That night he went to see U2, one of the few bands still touring, at New York's Madison Square Garden. It was a long show. The band played 14 songs and five encores. 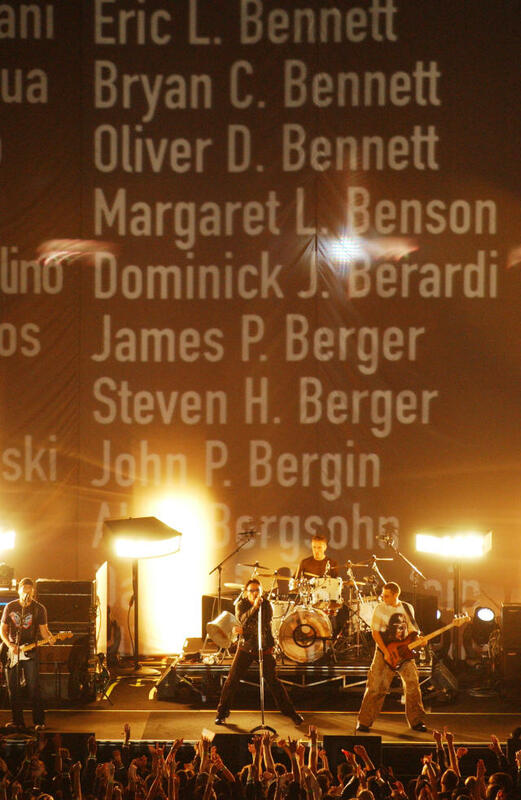 But the best moment came late in the concert as the list of the people killed on Sept. 11 was projected onto the crowd and the names scrolled across the roof of the arena. "I could hear people going: 'Oh my God,' " Collins recalls. "Then people started breaking down." Suddenly it hit him: This was exactly who should be playing the Super Bowl. At work the next morning, he met with two other league executives who were at the concert. They too had felt the same pull. Almost at once they agreed U2 was the perfect choice to play the Super Bowl. Collins called Jimmy Iovine, the chairman of Interscope Records, who had produced U2's Rattle and Hum album. Iovine came immediately. The NFL people talked about the previous night's concert and the names on the ceiling and they wondered if U2 would do the same thing at the Super Bowl. Iovine listened, then asked to use a phone. Then he picked up the receiver and called Bono. "The NFL has a great idea and I want to come over and talk to you about it," Collins remembers Iovine telling Bono. The next day, Bono was in an NFL conference room with Collins, Steeg, then-commissioner Paul Tagliabue, chief operating officer Roger Goodell and Patriots owner Robert Kraft. In the meeting, Bono laid out plans for an extravagant show, even suggesting different world music elements. Not everyone was overwhelmed. In fact, U2 was debated inside the league offices for several days. Some pointed out that a U2 television special had not delivered great ratings. 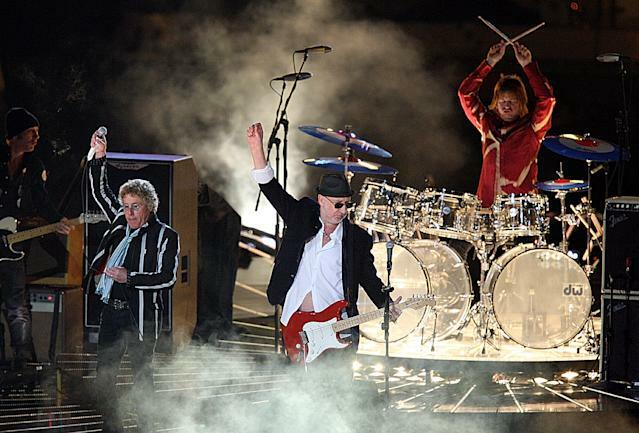 Others felt an Irish rock band might not be appropriate for a Super Bowl so close to Sept. 11. Eventually Tagliabue relented and plans rolled ahead until a major problem arose a few weeks before the game. There was no way to power the generator that would project the names of the dead across the Superdome roof. They were going to have to drop it. Collins was aghast. "Do what you have to do to get that power even if you have to put a generator on the roof of the dome!" he shouted to the organizers. "The only reason Paul Tagliabue approved this was because of the names going across the roof." Eventually, a generator was located, the proper power found and the projector worked. But still there was skepticism. After the Friday rehearsal prior to the Patriots-Rams contest, Collins and a group of league executives were leaving the dome when one moaned aloud: "This is going to be the worst halftime show ever." Instead, it became one of the best as the band started with "Beautiful Day," moved into a somber version of "MLK" and then broke into "Where The Streets Have No Name." The list of the dead rolled across a gigantic screen dangling high above the field. Late in the last song, the screen was released and it shivered down like one of the falling twin towers. The names kept rolling across the crowd and up over the ceiling just as Collins had remembered from that night at Madison Square Garden. "To some, it may have seemed rather a garish memorial, but in a strangely affecting way, it worked, and respectfully," wrote The Washington Post. The Boston Globe called it, "The greatest halftime show in the history of sporting events, hands down." The next day, the band's manager sent a letter to Collins that said, in part: "I feel sorry for who comes after." Ironically, that person was almost Bono. For several months, he spoke to the league about a line of superstar singers standing on one stage at the next year's Super Bowl in San Diego. It would be something along the lines of "We Are The World." However, he was unable to pull it together. Bono called Collins to decline. It seemed at the time his brief run with the NFL was over. Little did anyone know a whole different American disaster would bring him back. The NFL never planned to have a great opening show for the Saints' return to the dome in 2006. Then The Edge got involved. After Hurricane Katrina, U2's guitarist helped form Music Rising – a foundation whose purpose was to buy new instruments for musicians in New Orleans who had lost them in the storm. It was The Edge who approached David Saltz, producer of the league's season-opening shows, with an idea for a guitar chain to string across the field as a promotion for Music Rising. Saltz went back to Coplin with a single pitch: "This could be big." As summer came to an end, a flurry of phone calls went around. The Edge convinced Green Day to join. Then after Green Day said yes, The Edge went back to the rest of the members of U2, who also agreed. The Edge went to the league and asked to play a 25-year-old song called "The Saints Are Coming," from an obscure Scottish punk band called The Skids. Suddenly Coplin realized he was essentially being given a show bigger than most halftimes performances without even asking for one. "Everything we were talking about was better than what we had planned," says Coplin, who is now at the NHL. "Once the league realized this could be a beautiful moment, it just took off." 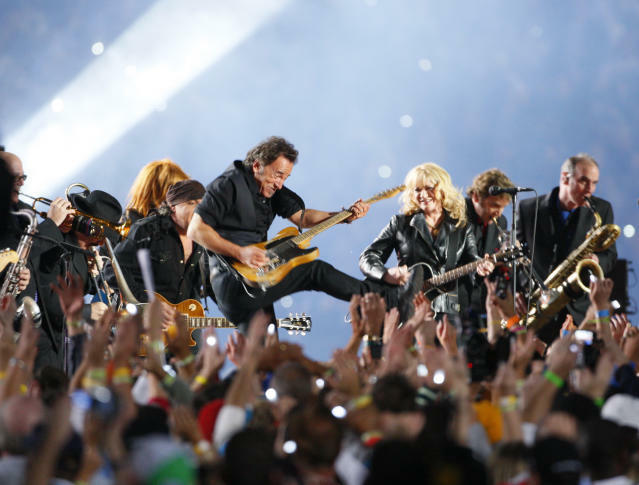 Soon the shape of a massive production emerged with U2, Green Day and a number of famous New Orleans artists, including the Rebirth brass band and Trombone Shorty. There was only one rehearsal. It took place the day before the Saints' game against the Atlanta Falcons. Because none of the bands had worked together, a session that normally would have been a one-hour sound check took five. Bono wanted to add New Orleans references to "A Beautiful Day" and stood on the stage for a long time scribbling words on a sheet of paper. Coplin fought hard to have the Saints run onto the field to "The Saints Are Coming," but the plan was rejected. "Can you imagine how great that would have been?" he says. When the rehearsal ended, the members of U2 jumped in a Suburban provided by the league and went to join in a second-line parade on the other side of the city. Davis remembers them dancing down the street waving ostrich feathers as the throng on the side of the road watched, oblivious to the identity of the crazy white men twirling behind the band. It took a homeless man, selling water from a shopping cart to understand. "Those people don't know who that is out there with them!" Davis recalls the man shouting. In the crowd that night, people wept. Doug Thornton, the dome's general manager and the man who oversaw the renovation, stood on the field and stared at the crowd. He had worried that the lights, turned down for the concert, might not go back up and so he allowed them to only be dimmed to the levels they were on the nights people took refuge from Katrina. To suddenly see people in the seats in the same faded light was jarring. And there on the field he cried. "I think for everyone it was an emotional night," says Lawrence Randall, the NFL's director of programming. Added Coplin: "I was at the league for nine years and did this for six years. For me this show meant the most because it wasn't planned. It just had tremendous heart." Not long after, U2 put the Superdome version of "The Saints Are Coming" on its greatest hits album. Davis later saw The Edge and joked that the band "had created a hit," right there in New Orleans. Locally they already had. Though Coplin never got his wish to see the Saints run onto the field to the song that night in 2006, the recording is in the group that is played in the Superdome on game days right before the team leaves the tunnel. It is the closest thing many Saints fans have to a team anthem. "The energy that these guys conjured up was literally unreal and Saints fans still listen to the song to get up for games," says Chris Bravender, a lifelong Saints fan from New Orleans. But the biggest contribution U2 might have made to the league is credibility. 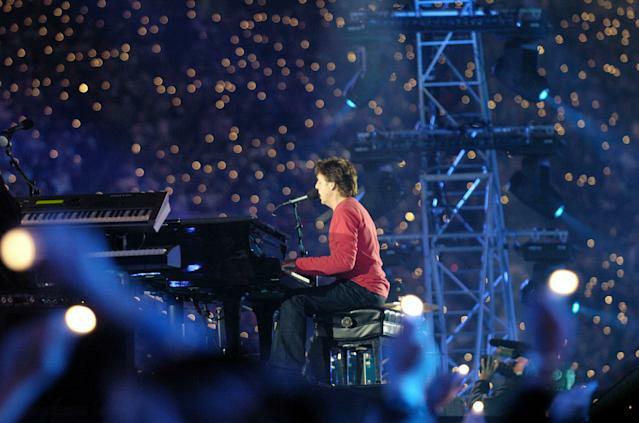 Before the Super Bowl in 2002, halftime organizers had trouble luring the largest acts. 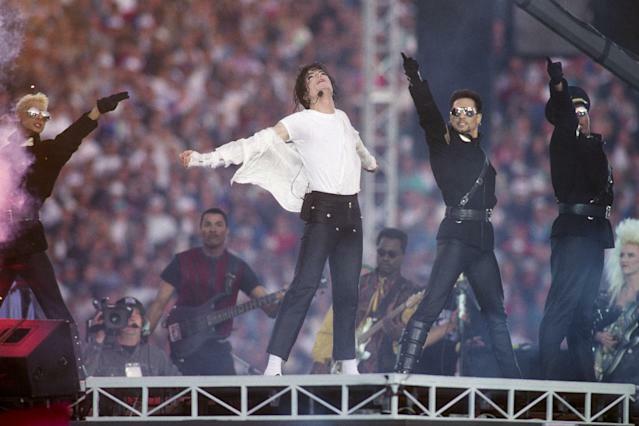 It did get Michael Jackson in 1993 in Pasadena, Calif., and let Diana Ross fly out of the Super Bowl in 1996 in a helicopter. But getting the biggest names was hard. "After U2 a lot of guys said: 'We get it,' " says Collins. If not for U2, he added, the league would never have been able to get Prince, Paul McCartney and Bruce Springsteen as it did in the years since. Then again, if not for a concert in the weeks after the worst morning, a band of Irishmen never would have been the league's link to recovery from two American disasters.